Not long ago, we came across a client who was very happy with their existing electrical schematic design process. Their team had been drafting the electrical schematics by hand with Google Sketch Up for the past 15 years before they agreed to see a demonstration of SOLIDWORKS with TriMech. In fact, the lead Electrical Engineer wasn’t even interested in SOLIDWORKS Electrical and claimed what he currently used worked just fine. At the time of this discussion, we discovered that it would take the company 1-3 weeks to complete their schematics by hand. To add to that timeline, if there was a design change they would need to start the entire project over again. After we showed their electrical team a demonstration on what the software could do, the same individual who said he would never use our software went against his first statement. He decided that he did not want to complete another project unless the company moved forward with SOLIDWORKS Electrical. They started with one seat of SOLIDWORKS Electrical Schematic Professional, and now they have four seats of SOLIDWORKS Electrical Schematic Professional and one seat of SOLIDWORKS Electrical 3D. Thanks to TriMech and SOLIDWORKS, this converted client has cut their drawing times in half. The client's entire electrical team has received training along with an Electrical Implementation. On top of this, any new hire also attends training. 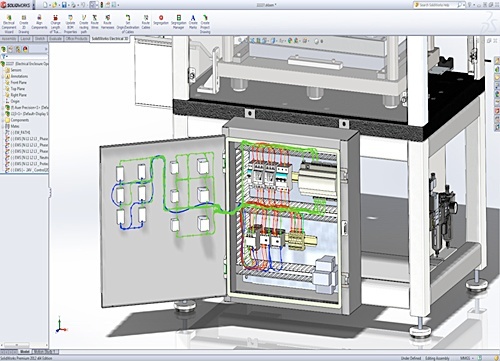 Their team has made it very clear that the time TriMech has spent with them and the use of SOLIDWORKS Electrical has changed the way they create their internal Electrical Schematics. As a cherry on top, the communication between the mechanical and electrical engineers has greatly improved because of better CAD communication with the software. For more information on improving communication between mechanical and electrical engineers on your team, check out our Let's Talk Electrical Infographic. Did this story resonate with you? If so, learn what SOLIDWORKS Electrical can do for your bottom line by simply request a demo from our team. You might be surprised by how much time you can save.